EdRLS aims to transcribe all the principal Stevenson manuscripts relative to each volume with a standard markup system. This work proceeds at the speed of the formation of a coral reef, but for the essays at least we are being helped by a handful of excellent volunteers not to mention the dedicated volume editors. Then, all at once, miraculously, as when you solve a crossword clue… we realized it was, yes! “hocus pocus“! Moments of hilarity followed as we realized that we had scored two points and seen form where there had been chaos and dark night. Added to this, we realized that Colvin had read “or” twice: once as “or” and then as “am-“, and then read the indecypherable, ambiguous sequence, appropriately, as “ambiguous”. Kirsty Nichol Findlay (ed. 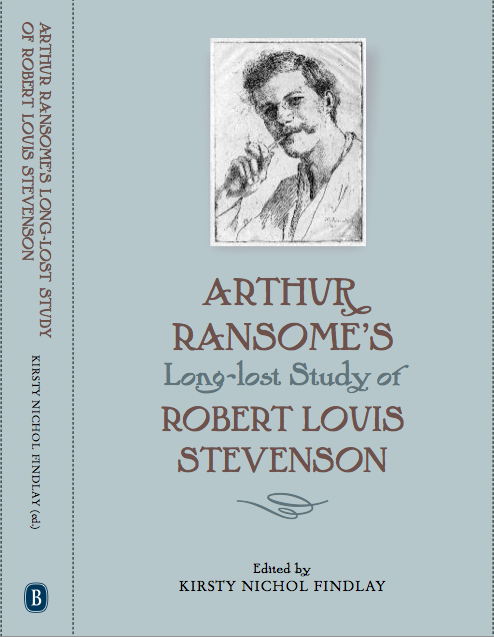 ), Arthur Ransome’s Long-lost Study of Robert Louis Stevenson. Woodbridge: Boydell, 2011. It was to have been “Robert Louis Stevenson: A Critical Study”, following Ransome’s earlier Edgar Allan Poe: A Critical Study (1910) and Oscar Wilde: A Critical Study (1912) and with the same pattern: a quarter of the book devoted to a single chapter called “Biographical” and the rest devoted to the works. (Gissing’s Charles Dickens: A Critical Study had apparently started the style of title, but he does not so clearly mark the division between life and works). The contract for the Stevenson book was signed in 1910 but Martin Secker pushed for the Wilde book first. Relations with author and publisher became strained and in 1912 they parted company. Ransome continued to work on the book in 1913 and 1914 for Methuen. In May 1914, when Ransome went to Russia to write a book on St. Petersburg, his wife Ivy, with whom relations were strained, apparently, and for her own reasons, took possession of the first draft manuscript, and deposited it in a bank. Meanwhile, Secker had given the Stevenson project and its title to a Frank Swinnerton, a rival of Ransome’s. The rancour in of the resultant study published in 1914 can be judged right from its curious dedication to a friend who was an admirer of RLS: ‘to Douglas Gray, in malice’. It may have taken some added intensity from its being an indirect blow at Ransome, who did not, like Swinnerton, belong to the Wells-Bennett group and who had a poor view of Swinnerton’s novels. Ransome did not complete the project: his first draft was not available to him, his life was in turmoil, what with his unhappy marriage, the First World War and the Russian Revolution and his meeting with his future second wife (Trotsky’s secretary) and their escape across the Baltic in a sailing boat. And then Swinnerton’s iconoclastic work (following the pattern that Ransome felt that he had invented) was the focus of everyone’s attention. The manuscript was never recovered and was discovered, unopened, in the strong room of a London solicitor’s in 1990. Kirsty Findlay has done us a service in editing the manuscripts (there is also an exercise book and some loose sheets) and in writing an excellent introduction. The first section, which tells the story of the manuscript has the appropriate Ransome-like title of ‘Parcel Post’, which puts us in the mood for a good story. In his essay “Kinetic and Potential Speech” collected in 1913 he calls for literary theory as the basis of criticism: “a statement of the nature of literature applicable not to the books of one nation of one time only, but to those of all nations and of all times”, so that criticism (he refers to “the history of literature”) can get beyond trivialities. As this is only an almost-complete first draft, parts are missing, parts are notes, and no doubt there would have been much revision had Ransome been able to complete the project. Nevertheless, it has the attraction of the opening of a time cylinder and is clearly a serious study, mainly admiring but not adulatory with some fresh judgements. Ransome deals with essays and early travel books together, then short stories, tales of adventure, Jekyll and Hyde and the Fables, the Scotch novels, and works produced in the South Seas. Ransome Divides Stevenson’s career into 1873-85, 1886-94 and sees the ten or eleven “earlier books” as “exercises in style” and “most of his essays are a kind of practice in this [stylistic] art” (98-99). This reminds us of the similar opinion of Daiches in 1947 and is for myself – an editor of the essays – the most disappointing judgment in the book. I would see it as related to the decline in critical opinion of the essay and its relegation to a peripheral status in the literary canon. Also by a desire by critics to note progress, to see an early and a late style. Ransome does, however, dedicate a generous amount of space to the often neglected Familiar Studies of Men and Books (pp. 100-106), including an interesting discussion of the meaning of ‘familiar’ in the title. The variety of style and stylistic experiments in Stevenson’s works is emphasized: “in art he was preoccupied with technique so largely that all he did seems now to have been by way of experiments during a prolonged adventure in the discovery of technical perfection […] he will be counted as one of the greatest exponents of the objects and the methods of literature’ (87). He also notes the common praise for Stevenson’s “charm” but goes further than other contemporaries by attempting to analyze what this might mean: “literary charm […] depends […] on tenderness exhibited by a writer for his subject, on the infectious mood in which a man looks affectionately upon the past” (95). The short stories he places among Stevenson’s best works: “It requires little courage to say that Stevenson is a very much greater storyteller than novelist, and even to say that his short stories are better than his longer tales” (109). He praises in particular “Providence and the Guitar” (111-12). Also the two stories in Scots: “Thrawn Janet” and “The Story of Tod Lapraik” “are among the best of Stevenson’s achievements. The dialect seems to knit the words together so that there are no interstices to allow reality to slip out” (114). One influence of RLS in the 1890s and early 1900s is shown by the observation that to The New Arabian Nights “we owe […] the many miraculous Londons that have been discovered in these latter years” (113).